( March 8, 2013, Toronto, Sri Lanka Guardian) A number of commentators, including Mr. Dayan Jayatilleke (ex-Sri Lankan ambassador to France), Mr. Mahawatte (a technical officer who worked in the North in 1983), Ann Abesekera, and perhaps others have written about the Black July pogrom in the Island Newspaper published in Colombo (see the Island, 6th March, for the latest comment by Mr. Dhanapala). Such topics always get re-examined when the `Human Rights' record of Sri Lanka gets reviewed. What actually happened is less important than the emotional truth of the pain. Anyone who contravenes this icon of angst would be instantly outcast by most Tamils expatriates. Since my family has always been outcasts, this matters little to me, and we mutually keep apart. 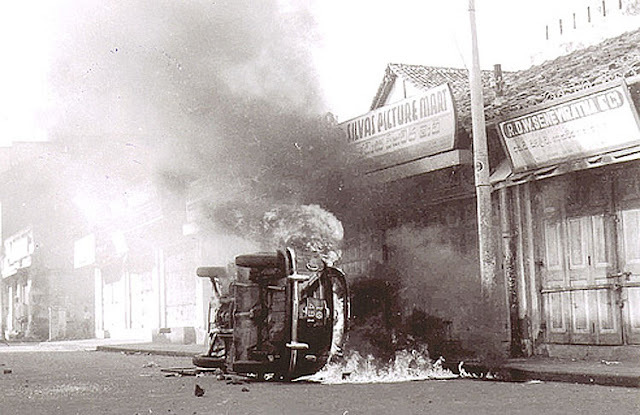 Sri Lanka has had Tamil-Sinhala communal riots starting from 1939 when Ponnambalam attacked the Sinhalese at a Nawalapitiya meeting, calling the Sinhalese `racial half breeds'. That riot was put down rapidly by the British. The World War II provided a respite, while D. S. Senanayake's rule was an attempt to construct a Ceylonese nation that was supported by Ponnambalam, but rejected by Chelvanayagam in his 1949 Thamil Arasu (i.e., soveriegn) Kadchi (ITAK) declaration. However, it was the Sinhala official Languages act as well as the legislation against caste discrimination introduced after 1956 that irritated the Tamil leaders when Bandaranaike came into power. The ITAK began a program of civil disobedience, tarring of Sinhala street signs and the `Sri' symbol on vehicules. This led to a new wave of riots that occurred sporadically from 1958 onwards. The Vaddukkoddei resolution of 1976 called for the creation of a separate Tamil state (Eelam) by civil or military means. An invigorated Tamil Nationalism began to nurture a militant youth wing which spawned the LTTE. The backdrop to the 1983 pogrom, now know as `Black July', was the assassination of 13 soldiers by the nascent LTTE using time-controled explosives stolen from the cement factory, as recounted by Mr. Mahawatte. This was the first time that the army had been given such a severe, pre-meditated blow, leading to great anger in the Sinhala south. The bodies of the soldiers were brought to the Kanatte cemetery, and the funeral turned into a riot of vengence which spread uncontrolled, where innocent Tamils were burned, butchered and their property was pillaged with the police and the politicians remaining impassive. I was in Sri Lanka at the time, and our family escaped harm. Since I had married an estate-Tamil woman, and since I myself came from a `very low caste', I was essentially excluded from most Tamil circles who regarded our very presence as `polluting'. As such I was living in a poor Sinhalese area where the people were friendly and protective. We were not in any Tamil `lists'. However, we continue to ask `who were responsible for the horror and violence suffered by so many innocent people' ? The government of the day acted in the most ignoble manner. Mr. Dhanapala asks, why didn't the police, with a Tamil IGP and five or six DIGs in the Colombo area, the accredited guardian of law and order not act? How is it that no Tamil police officer of the era has so far failed to come forward to explain their criminal negligence of duty? It has often been pointed out that goons who had lists of Tamil addresses went around causing mayhem. LTTE sympathizers had been doing the rounds of Tamil houses for many months prior to the pogrom, collecting money for their cause. The IGP, six of his deputies (DIGs) and many police, being Tamils, would have been in those lists. So the existence of lists, and the money collection would (or should) have been well known to them. Mr. Nadesan (later Prabhakaran's police chief) was a senior officer in the Colombo-Nugegoda area; he surely knew about the collections for Prabhakaran. Prabhakaran's dissatisfaction with the disengaged Colombo Tamils was well known. Many Tamils simply refused to contribute or be intimidate while strongly supporting the TULF. In my belief, the 1983 pogrom started as a spontaneous Sinhala reaction to the killing of the 13 soldiers by the LTTE. However, the uprising was immediately hijacked by parties (most probably of the LTTE) who had the Tamil-household lists, to intimidate those non-conforming Tamil homes who did not contribute to their Eelam cause. However, they in turn were out-numbed and hijacked by even more horrendous goons, jingoists, sadists etc., who moved in to profit from pure pillage and plunder. If a senior Tamil officer (or any Tamil) who knew of these matters had come forwards with the facts, he would have been targeted as a traitor and not lasted a day. Even today, none would dare, because `Black July' is a hallowed moment of anti-Sinhalese-angst among the Tamil Diaspora and some righteous `liberals' of Colombo. The president of the time, Mr. J. R. Jayawardena, who usually tries to blame the `Naxalites' for everything, found it very convenient to put the blame on Mr. Cyril Mathew and the Sinhala groups that Mathew represented, there by clipping their growing power that JR felt was threatening him. A panel of historians and social scientists should investigate the actual facts of `Black July', even if such a research may reveal little. However, such an exercise should be purely to put history right, and NOT to `punish' anyone. The country has been punished enough for many decades of horror since 1983. It is time to forget, forgive and move forward, rather than continue to use July 1983, or May 2009 as `beggar's wounds' to attack and criminalize Sri Lanka.